This ain’t Gramma’s frozen tuna casserole! This freezer-meal-salmon gets a tropical makeover with a mango and avocado salsa. 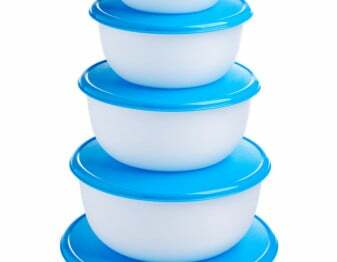 The old way of making meals for the freezer was to do a big fully-cooked casserole, freeze the reheat. 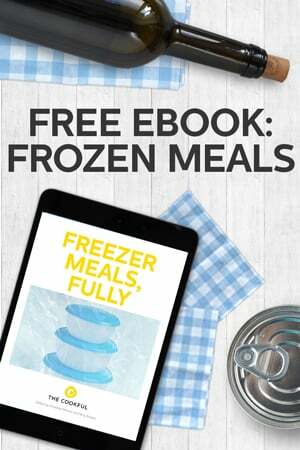 The modern take on freezer meals is quite different. The goal is great-tasting food with little effort on the day you’re eating it. For today’s twist, you actually do cook a little bit on serving day. But we promise, it’s only for a few minutes. 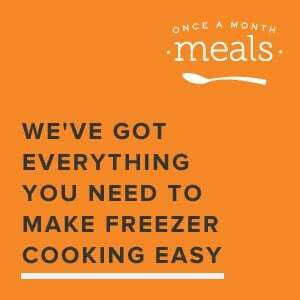 When you’re thinking about making delicious freezer meals, remember that not everything has to be pre-cooked. Some ingredients are best frozen raw and then cooked at the last minute. When it comes to fish, it’s best to flavor the raw fish (with a rub or marinade) and then freeze it raw. On eating day, you can defrost it and panfry it OR you can bake it straight from frozen. 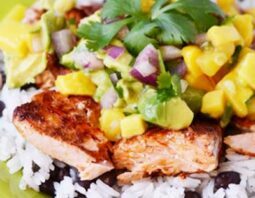 For this salmon recipe, you premake a side dish of jasmine rice and beans as well as a mango and avocado salsa. The raw salmon gets a jerk rub before being frozen. 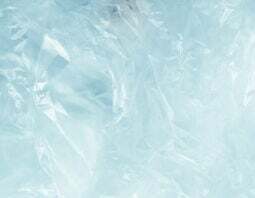 To serve, defrost every thing. Then heat the rice and beans and quickly panfry the salmon. Top with the salsa and grab a fork! Rub salmon filet all over with jerk seasoning and 1/4 tsp. sea salt. In a large bowl toss together cooked rice, black beans, 1/4 tsp. salt and pepper. Set aside. In another bowl toss together mango, onion, cilantro, avocado, and lime juice. 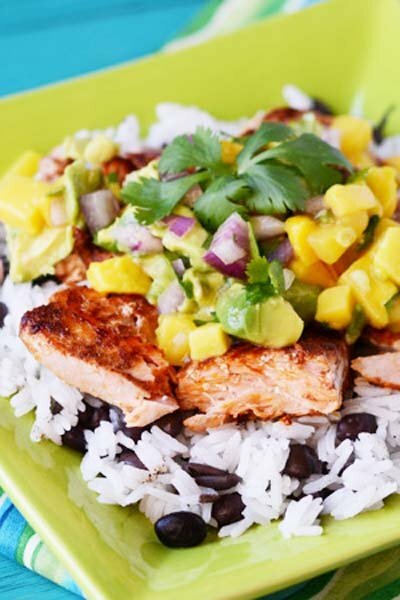 Layer rice and beans onto each plate or bowl, top with salmon, and then finish off with mango salsa. Rub salmon filet with the jerk seasoning and sea salt. Divide filets among half of the gallon bags. In a large bowl mix the cooked rice, black beans, salt and pepper. Divide mixture between the remaining half of the gallonbags. Place this bag inside of the bag with the salmon. 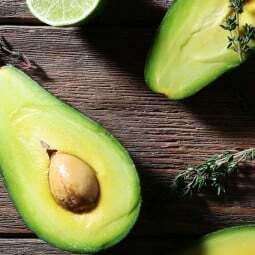 In another bowl combine the mango, onion, cilantro, avocado, and lime juice. Divide among the quart bags and place inside the bag with the salmon. Label and freeze. Heat oil in a large skillet over medium heat. Add salmon skin side down and cook until browned, about 3-5 minutes. Flip cook on meat side until browned, 3.5 minutes. Remove skin and break salmon into pieces. Cook until no longer translucent and remove from heat immediately. Meanwhile, reheat rice and beans. 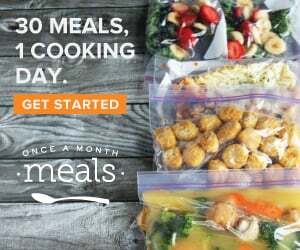 Divide rice and beans among dinner plates and then top with salmon with mango salsa. Looks so flavorful and healthy! I am craving this big time right now!! So fresh and clean!